Given their overall size, the stock market and economy resemble a large oil tanker much more than a speed boat. Rather than turning on a dime or suddenly changing speed all at once, there is often an unseen and well-charted process that accompanies gradual changes in economic momentum. For investors, being able to identify these turning points as they unfold is crucial toward staying on the right side of the trend. Focusing on the stock market, breadth can provide insightful information in gauging whether the stock market’s advance is healthy or possibly running out of steam. As evidenced by the data below, the market is currently showing an incredible amount of strength with little signs of an impending top. Let's focus on the tops. We talked a little bit about breadth and we talked about how a top is a process, unlike the bottom being more or less a point. If investors are a little concerned, what should they specifically be looking for in order to see signs of a market top? Well, if we were in the fall foliage season prior to winter, what we would tend to see in the trees up north, we'd start to see leaves dropping off the tree one at a time. And the stock market is very, very similar, that as you get into the latter stages of a bull market, individual stocks tend to peak out and begin to drop into their own individual bear markets, while there are still a lot of stocks continuing to advance. Let's talk about that. You recently gave a presentation to a room of professionals where you asked them a series of questions. You were surprised by them, and they were surprised by what you told them. Would you talk about that? Well, I had a group of professional portfolio managers that we were addressing, and I wanted to tell them about this new study that we had just done. And I asked them, 'What percentage of stocks would you expect would be making new highs at the top day of the bull market?' In other words, when the Dow Jones was making its absolute high, what percentage of stocks were also making new highs? I asked, 'How about 80%?' and there were a lot of hands. Then I said, 'How about 70%?' and there were a slightly smaller number of hands. 'How about 60%?' and smaller number yet. And I think I took it down to about 50% or so. And I said, 'would you believe 6%?' There was this complete silence in the room. Of the 14 major market tops, between 1929 and 2000, inclusive, when the Dow Jones Industrial Average reached its absolute peak, the average percentage of stocks also making new highs on that day was 5.98%. The analogy to the changing seasons is very applicable to the stock market: strong market breadth is akin to summer, weakening market breadth to fall, very poor market breadth to winter, and improving market breadth similar to spring. By analyzing this process in multiple layers we can make informed investment decisions about market trends. Here I provide several technical studies highlighting the markets' overall breadth and show that, currently, we see no sign of a near-term top. The 200 day simple moving average (200d SMA) is a widely used moving average to determine a security or stock market’s long term trend. While many technicians simply look at the percentage of stocks above or below the 200d SMA, greater insight can be gleaned by adding another layer of analysis which is the directional trend in the 200d SMA. Analyzing the percentage of securities above or below the 200d SMA and also the trend in the 200d SMA creates four distinct categories and these four categories can be used to equate to the four seasons. 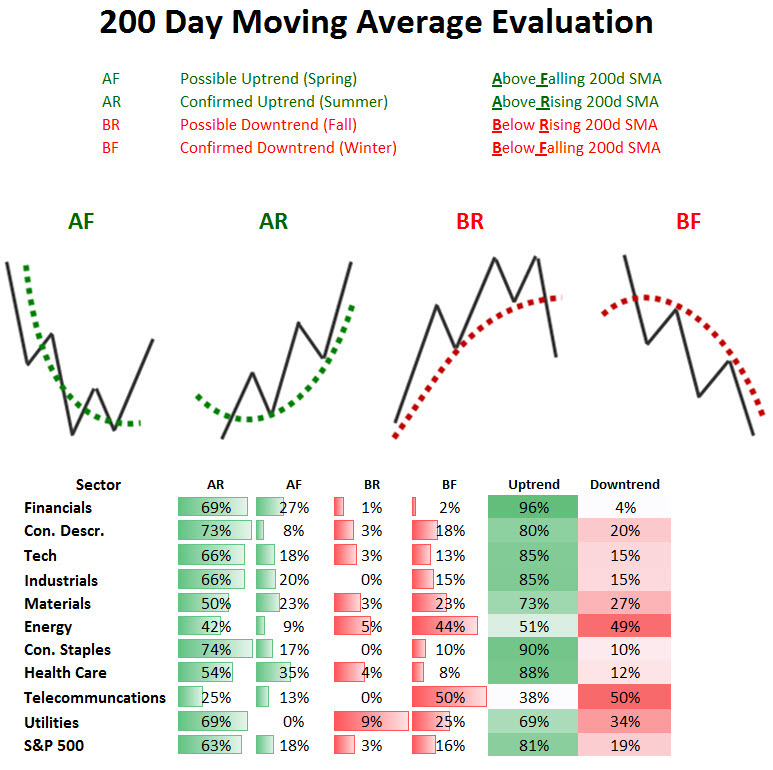 Stocks that are Above their Falling 200d SMA (AF) are in early uptrends (spring) while stocks Above their Rising 200d SMA (AR) are in confirmed uptrends (summer). Stocks that are Below their Rising 200d SMA (BR) are in early downtrends (fall) and stocks Below their Falling 200d SMA are in a confirmed downtrend (winter). Healthy bull markets are characterized by a high percentage of stocks that are above their 200d SMAs (uptrends) while bear markets show the opposite (downtrends). Breaking down the 500 stocks within the S&P 500 shows that the bulk of stocks are in the AR category (63%) with the next highest group seen in the AF category (18%). Combing both groups shows that 81% of the S&P 500 members are in uptrends while only 19% are in downtrends. This represents a healthy bull market where the bulk of the market in terms of seasons are in summer with a few still in spring (early bull markets). As a bull market approaches a top you should see a large percentage in the topping category (BR, fall) and right now only 3% of the S&P 500 members reside in this category. What should also be encouraging to the bulls is that the sectors most levered to the economy (cyclicals) are showing some of the strongest breadth, which is important as these sectors are usually the first to top out and enter the BR and BF categories. The best and worst industry groups in terms of breadth are shown below. Another technical tool to measure the market’s breadth is looking at short (1-month), intermediate (3-month), and long term (6-month) moving averages in relation to one another. How these three moving averages relate to each other gives rise to six groups which can be classified into three different uptrends and three different downtrends. A diagram showing these different groupings is shown below. Looking at the 500 stocks within the S&P 500 shows 70% of them in confirmed uptrends and 10% in confirmed downtrends. There is a significant 15% of the S&P 500 in the possible downtrend (D1) category which could mean one of two things: either the market is showing early signs of an intermediate top in which stocks will migrate closer to the downtrend categories (i.e., U3 -> D1) or the market is simply consolidating and members within the D1 category may shift back to the U3 category. 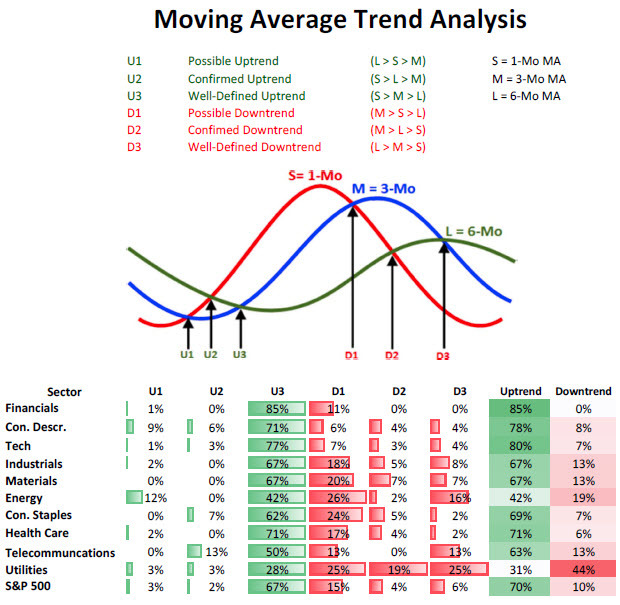 Looking at the table below for the various ten sectors shows that the cyclical sectors have only a fraction of their members in confirmed downtrends (D2 + D3), which tends to support the idea that the significant percentage in the D1 category is likely due to a consolidation in the market rather than foretelling a top. For example, 0% of the financials are in downtrends and only 8% of the consumer discretionary sector is in a downtrend and only 7% of the technology sector is in a downtrend. While many bears like to point to Apple (AAPL) as distorting the markets and making them look stronger than they are, the fact that 80% of the technology sector is in a confirmed uptrend and only 7% are in downtrends throws that logic out the door. Overall, with only 10% of the market in a downtrend and 70% of the market in an uptrend, that type of makeup is characteristic of a strong bull market. What also has me leaning towards the idea that the 15% weight in the early downtrend (D1) category may lead to a consolidation versus the early formation of a top is that the groups showing the strongest percentage in uptrends (U2 + U3) are all cyclical industries with utilities, one of the most defensive groups, showing the highest percentage of stocks in downtrends. Another way to look at market breadth is the percentage of the stock market hitting 52-week highs and lows. Typically, at market tops there are fewer stocks making new 52-week highs and often an equal percentage making new 52-week lows. Conversely, healthy and strong bull markets show a much larger share making new highs than lows while bear markets are associated with more stocks making new lows than highs. Shown below is the percentage of stocks within each sector that have made a new 52-week high or low over the last month. As you can see, stocks making new 52-week highs dwarf those that are making new 52-week lows. 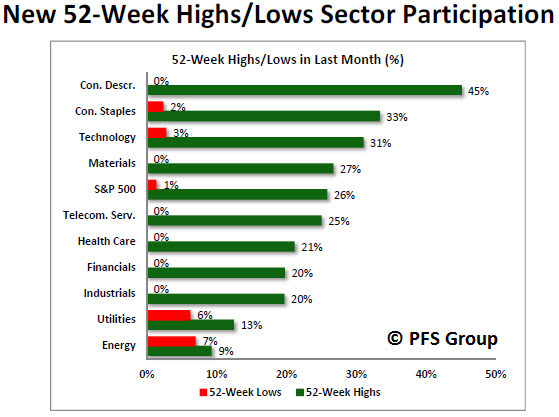 Another important point to make is the broad participation in sectors whose members are making new 52-week highs, where 8 out of 10 sectors saw 20% or more of their members hit new 52-week highs over the last month. Overall, 26% of the S&P 500 members hit new 52-week highs over the last month while only a meager 1% made new lows. Again, this is the type of data associated with strong bull markets, not markets on the verge of rolling over into bear markets. When reviewing multiple methods of analyzing the market's health, the clear message given is a healthy market with broad-based participation and not showing any indication of rolling over into a bear market. In terms of seasons, we are clearly in the middle of summer and we will know we are entering the fall (market peak) when individual leaves start falling off the trees (more stocks move into bearish trends). As of now, according to various breadth measures the sun is shining and the skies are clear.